If you looked around my shop and took inventory of my tool chest you might observe that I don’t own a proper jointer or try plane. On the other hand, I would argue that I actually do. They just don’t happen to have No.7 or No.8 on the tail end. Instead, at least for the moment, I’ve found my sweet spot with the oft maligned Stanley Bailey No.6. Two of them. Both of these beauties were rusty when I got my hands on them, and one had a replacement blade that was almost used up – a good omen to be sure. I know that most collectors go nuts over having all original parts (the less use the better) but as someone who is intending to use the plane, seeing that the original owner(s) went through at least one blade tells me that the plane is true and will be a great worker. I replaced the worn out blade (on the plane to the left) with a blade/chip breaker set from Veritas. There are several folks making fine replacement blades for planes at the moment, but the one advantage I could see with the Veritas blade was that I wouldn’t need to modify the plane to get everything to fit. The other advantage is that the chip breaker is lapped to within a micron of its life, so it gives a nice tight fit to the blade with no nonsense appeal. In any event, it’s a great blade and it immediately made the plane sing. With a very gentle camber this plane could now do everything from jointing edges to flattening a panel to squaring up drawer parts, shooting ends and, quite frankly, just about everything else I could throw at it. But there’s one thing more. The one thing Moxon couldn’t believe his fore plane could do is one thing mine does with gusto. 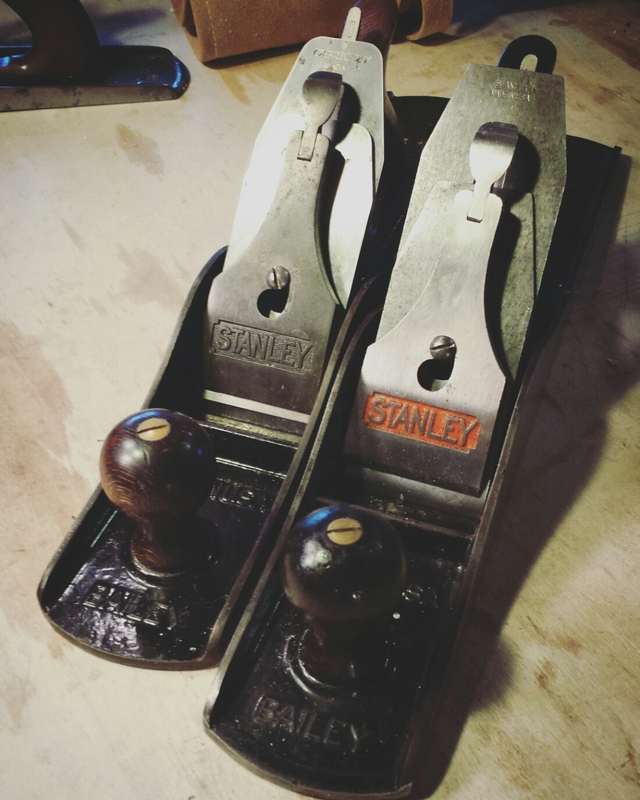 I have also relied on my Stanley No.6 to do a decent amount of smoothing. I don’t mean the final touches, but honestly, I get the bulk of smoothing done on panels with my No.6 and then come back for one final pass with my smoother. Moxon apparently worried himself sick over the “dawks” or tracks that his fore plane left for the smooth plane to clean up, but I’ve found with that cambered iron set fine I can adjust the blade to both leave and remove said dawks by moving systematically from one side to the other. The tracks help me keep apprised of where I’m at on the board, and show me where I need to go. What is left behind, when I get the whole way across, is a nice, flat, smooth surface. The other No.6 (the one on the right) belonged to my wife’s grandfather. It languished for a while on a garage wall (like 50 years) but a few weeks ago my father in law sent it home with me and I took it under my wing. The blade on this one already had a perfect camber (another good sign that it was used well) and it just needed a deep clean and a good sharpening to get it going again. I took the extra step of stripping the lacquer off of the knob and tote and refinishing the beautiful rosewood in a simple waxed oil finish. I know that the No.5 gets billed as the Jack-of-all-trades plane, but I reach for my No.6 far more often. So often in fact that if I weren’t emotionally attached to my No.5 (she was my first) I wouldn’t hesitate to work with just my No.4 1/2 and my No.6 (or both of my No.6 planes) and leave the rest on the shelf. I wouldn’t mind adding a No.8 to the hangar at some point if I ever came upon one at a price I was happy with, but honestly I’m pretty happy with what I’ve got. A pair of sixes is hard to beat. Previous Post Back where we began, with a step in the right direction. I’ve been wanting a 6. Haven’t found one in my area and the weak Canadian dollar has me hesitant to pull the trigger on an eBay find. I try to remind myself that unless I really need a particular tool for a particular project, I can wait until I come across something that I can’t pass up. That usually works. It worked with both of these planes at least. I think I paid $35 for the first one before I fitted it with the aftermarket blade. Thanks to Patrick Leach you can still pick up a 6 for reasonable money if you’re patient. Good luck!